The following tips will keep you more informed when buying a projector lamp on-line. Asking a few questions could save you time and money. Projector manufacturers generally do not sell their lamps as "bulb only" without plastic housing due to the safety, performance and projector damage risks associated with refurbished lamp modules (click here for more on the risks of bare bulb replacement). After all, do you want a hassle-free, user-friendly replaceable lamp or an electrical engineering project? If cost is a factor, there are safer options available, such as Alternative Lamps. 2. Always ask "Am I getting a manufacturer original lamp with housing?" This simple question can protect you from buying a badly labeled product by accident. Most webstores have a "contact us" page where you can send an e-mail or telephone the company directly. If the answer you get is unclear, confusing, or simply avoids the question, be cautious. Remember that "this lamp fits your Sony projector" could be an entirely different statement to "this lamp fits your projector and is made by Sony". At Projector Lamp Experts, rather than discourage you from purchasing more affordable alternatives, we make alternative options readily available and always make sure that you are aware of exactly what you are buying. We only sell original alternative lamps made by Alternative Lamps Co, a leading lamp manufacturer. Alternative Lamps are manufactured to ISO9001 standards and tested exhaustively for bulb performance, brightness and lamp life, every Alternative Lamp product comes with a 90 day Peace of Mind Warranty, which means that in the unlikely event a lamp fails and causes projector damage, we will buy you a brand new projector of equal performance. Click here for more information about Alternative Lamps. 3. Always check that you are getting a good warranty with your lamp, especially if you believe that you are being sold a compatible product. Treat companies that are unclear about what they are selling with caution. A "no questions asked" lamp warranty is of no use if the lamp causes damage to your projector. Alternative Lamps Co. is the only company in the world that offers you a warranty covering your projector against damage due to lamp failure. Alternative lamps are backed by our an exclusive Peace of Mind Warranty, which means that in the unlikely event an Alternative Lamp causes projector damage, we will buy you a new projector of equal performance. Click here for more information on Alternative Lamps. 4. If you have purchased a lamp from a company that you suspect has sold you a mis-labeled product, check whether the box it was sent in has manufacturer markings printed on it. One indicator of grey or black market products can be when the boxes they are shipped in are plain brown or white, lacking manufacturer markings (note: the logo of the company that sold you the lamp does not constitute a manufacturer logo). 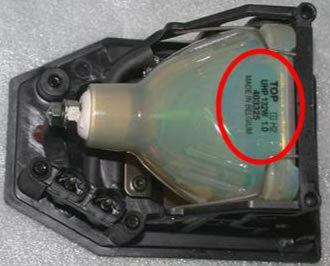 Some companies mislead customers by covering-up a compatible lamp manufacturer's sticker with an original manufacturer's. Always check underneath the shipping stickers if you believe you have been deceived. See the image below as a good example of this. An original replacement lamp usually will have the manufacturer's logo clearly visible like the Sharp product below. Manufacturer original lamps are normally stamped with a code that identifies which company made the actual glass bulb inside the lamp. As you can see from the picture below, this bulb has "UHP" stamped on it on the second line. UHP indicates that this bulb is an original, made by Phillips. Also look out for the following codes: P-VIP means Osram lamps, UMPRD and NSH denote Ushio lamps, SHP means Phoenix lamps, HSCR means Iwasaki lamps and HS means Matsushita lamps. All major projector brands specify lamps from the above lamp factories. If your lamp does not have one of these codes printed on it, it may not be an original. If you would like more information on original rear projection TV and Projector bulb manufacturers please visit our dedicated section on manufacturers. 6. If you need advice, just give us a call. We are always happy to give customers advice on their projectors and replacement lamps. Our staff are trained Certified Technology Specialists (Gold Level) as designated by InfoComm International, and can help you with any questions you have about replacement lamps. Visit our contact page for details on how to get in touch with a Lamp Expert.